Oblepikha Intensive Moisturising Shampoo is produced by the Russian brand Natura Siberica for its Oblepikha Siberica series. It is specifically designed for dry and normal hair. The shampoo delicately cleanses and intensively moisturises your hair, protecting it from heat exposure during hot styling. Its active ingredients penetrate deep into hair structure, hydrating your hair and enriching it with nutrients that make it look healthier. Regular use of the shampoo makes combing and styling easier, tames your hair and prevents brittle hair. The shampoo contains vitamins and amino acids that nourish and restore damaged hair. Altai sea buckthorn oil and Moroccan argan oil stimulate keratin synthesis, which makes your hair stronger and shinier. Taiga lungwort and wheat germ oil help to retain moisture deep within hair structure. Ingredients. Aqua with infusions of: Anemonoides Altaica Extract*, Cetraria Nivalis Extract*, Macadamia Ternifolia Seed Oil*, Pinus Pumila Needle Extract*, Pinus Sibirica Seed Oil*, Pulmonaria Officinalis Extract, Triticum Vulgare (Wheat) Germ Oil*, Hippophae Rhamnoides Fruit Oil*, Sodium Coco-Sulfate, Cocamidopropyl Betaine, Lauryl Glucoside, Coco-Glucoside, Glyceryl Oleate, Guar Hydroxypropyltrimonium Chloride, Hydrolyzed Wheat Protein, Panthenol (provitamin B5), Retinyl Palmitate (vitamin А), Tocopherol (vitamin E), Ascorbic Acid (vitamin С), Hippophae Rhamnoidesamidopropyl Betaine, Benzyl Alcohol, Sodium Chloride, Benzoic Acid, Sorbic Acid, Citric Acid, Parfum. 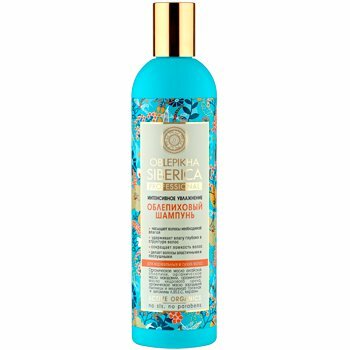 Want to buy Oblepikha Intensive Moisturising Shampoo? Call us or submit your order via our web site! Oblepikha Siberica Professional is a natural cosmetic line produced by OOO Natura Siberica, a well-known Russian cosmetic company that produces natural and organic cosmetics. Natura Siberica is a subsidiary of OOO Pervoe Reshenie (First Solution) founded by the Russian entrepreneur Andrei Trubnikov. The Natura Siberica brand was launched in 2008. Organic cosmetics weren't exactly popular in Russia back then and some consumers even treated such products with suspicion. But eventually Trubnikov's venture turned out successful. Due to the unique combination of wild Siberian herbs and ancient recipes, Natural Siberica products have become extremely popular. As of February 2016 the brand generated half of the total revenue from all brands owned by OOO Pervoe Reshenie (according to the Russian web portal RBC). Herbs and berries used to produce Natura Siberica products, including its Oblepikha Siberica Professional line, are grown on the company's own organic farm in Khakassia as well as harvested in the wild. The brand's products meet the highest quality standards, which is confirmed by international quality certificates such as ICEA (Italy), ECOCERT (France), COSMOS STANDARD (the UK, Italy, France, Germany, Spain), and BDIH (Germany). Personal care products produced by Natura Siberica have become Russia's first certified organic cosmetics. Today they regularly participate in various international exhibitions and contests and win prestigious awards. For example, Natura Siberica won a Beauty Challenger Award in the category Best Skincare Product at the Beyond Beauty exhibition in Paris, France. Love the smell (very sweet, almost candy like, but sooooo nice), love the result. It helps keep my hair clean, now I wash it every other day instead of daily, and it still looks and feels great. I will definitely buy another bottle.